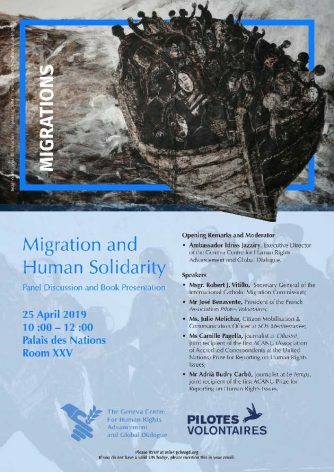 GENEVA, Apr 6 2019 - On the occasion of the launch of its two-volume publication entitled The Unprecedented Rise of People on the Move in the 21st Century, the Geneva Centre will organize a panel discussion and book presentation. The discussion will expand on the themes of the publication, with a particular focus on migration and human solidarity, as well as on the recent developments in Western societies with regard to current migration flows. The panellists will discuss, inter alia, the increasing hostility towards migrants and refugees in European societies and the manipulation of this issue for political ends, the growing criminalisation of migration, the role of civil society in addressing the plight of people on the move, as well as the importance of multilateralism and international cooperation in the context of this crisis.